We have come to expect great things from director Wong Kar Wai. After films such as In the Mood for Love and 2046, how could you expect anything less? Alas, his latest film and English language debut, My Blueberry Nights, falls just short of the mark. Wong's keen eye for visuals and atmosphere are on stunning display here as usual, but there is little substance underneath the glowing neon hues. The film centers around a young woman named Elizabeth (Norah Jones, in her acting debut), who after discovering that her boyfriend is cheating on her with another woman, forges a fleeting connection with handsome restaurateur named Jeremy (Jude Law) before hitting the road on a cross country journey to start anew. Along the way, she meets a cast of similarly wounded characters whose lives she changes in unexpected ways, but she can never forget those nights she spent eating blueberry pie with Jeremy, and the time that she was most happy. The material is ripe for something deep and moving, but the final product is ultimately flat and aimless. Wong seems more infatuated with making a beautiful movie - and in that regard he succeeds; My Blueberry Nights is an excellent mood piece. But the characters are so underdeveloped and static that they come across more like cardboard cutouts of generic problems than three dimensional personalities. There's Arnie (David Strathrairn), the alcoholic cop trying to recover after his wife left him; his wife Sue Lynn (Rachel Weiss) who just wants to move on with her life but still harbors buried feelings for Arnie, and Leslie (Natalie Portman), a compulsive gambler with some serious family issues. The actors do the best they can with the material they are given, but there's really not much there to work with. They're more walking issues than characters. David Strathairn makes the biggest impression of anybody as Arnie. His southern accent is one of the best I have ever heard in a film, and of all the actors in the film, Strathairn is the standout. He gives the best supporting performance of the year so far. I wish the same could be said of Norah Jones, who is not bad in her first acting role, but she does not have the chops yet to carry an entire film. Her character lacks depth, which is partially the script's fault, but Jones is unable to lend the weight that the role needs. Maybe with time and experience we will see some growth from her, but in this instance anyway she seems in way over her head. The same could be said of Wong, who seems woefully out of his element in the English language. The dialogue lacks his usual poetry and seems surprisingly superficial. The film is also filled with heavy-handed symbols (keys! blueberries! bar tabs!) that really add nothing to the film, contributing to sense that this is really just an unfocused mess dressed up to look pretty. While in the end, the cinematography and music give off a sultry, smoky vibe that borders on intoxicating, Wong never backs it up with anything of meaning. 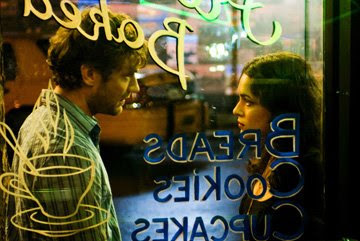 My Blueberry Nights is an effective mood piece, but it could have been so much more. 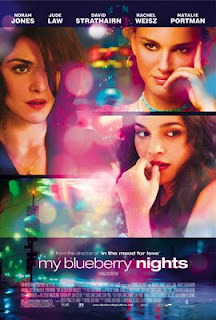 MY BLUEBERRY NIGHTS; Directed by Wong Kar Wai; Stars Norah Jones, Jude Law, Natalie Portman, Rachel Weisz, David Strathairn, Frankie Faison; PG-13 - mature thematic material including violence, drinking and smoking; Opens today in select cities. That's sort of what I've been expecting: pretty but hollow. But I can deal with that. Especially if it's as neon-packed as I hope it us. Sorry to hear you didn't like it better Matthew, but this one is critic proof for me. Expectations: Modest. Hopes: High. I agree with both J.D and Craig. I am not such a huge fan of neon though....only if it is not trashy. I have high hopes for this one, and all I expect is it to be beautiful and have good music! It has such a good cast though, so sad…. I have wanted to see it forever, and I think I always knew it could be less than stellar but I just have to hold onto my dream that I will love it just a little longer. It opens in SA in May and I will not try to see it earlier, I will just live in quiet desperation that I find something to love in it a little longer. The older I get, the more I'm entranced by images ... sort of the equivalent of a baby being engaged by sparkly things, I guess.